> final draws of the Bremer Lotto GmbH Program. > year. No tickets were sold. > fifty (50) lucky winners in this category. > unwarranted taking advantage of this program by the general public. > your prize funds into your designated bank account. > participate in this program. I am Mr.Thomas Richardson, the fiduciary agent assigned to your case to help you in the claims process of your funds. I wish to congratulate you and to say you are a lucky person to have won this lottery. All the winners in the Lottery were selected by an advanced automated random computer ballot search from the internet as part of our international promotions program which we conduct every year.No tickets were sold. 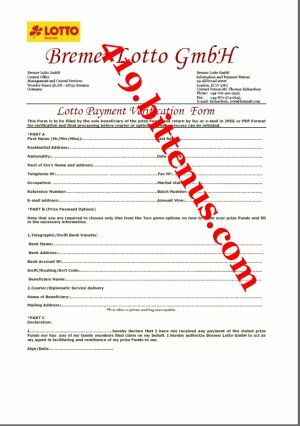 You are required to fill the attached Lotto Payment Verification Form to facilitate the processing of your claims which will lead to the payment of your prize to you as required. You are also to send a copy of your International Passport or Drivers License along with the filled form. If you do not have any of these, you can send your National Identity Card or any other form of Identification. You are to choose only One (1) from the Two (2) given options on how to claim your prize. For any option you choose, you are to fill in the necessary information . 1. Transfer of your funds to your local bank account by Telegraphic Bank transfer and your funds will be in your account within 48 hours. 2. You employ the services of our affiliate courier/diplomatic service to deliver your prize Funds to you in form of Consignment to your physical mailing address. You will be totally responsible for the Telegraphic Bank Transfer Charges OR Courier Charges. When we receive your Filled Form, we will send you more information about any option you choose. You are to send your Filled Form and Scanned Identification by Fax or E-mail (JPEG or PDF) format.